In the past years, several types of invisibility cloaks have been developed, hiding objects not only from light, but also from sound and even heat. But this is the first time an invisibility cloak for touch has been developed. Recently, we’ve written quite a lot about invisibility cloaks – how they work, how they can be improved, and what real life applications they have (aside from being really cool) – like for example protecting cities from earthquakes (yeah, really). But what about a “touch invisibility cloak” ? Naturally, it is constructed very differently – based on a metamaterial that consists of a polymer with a special structure. 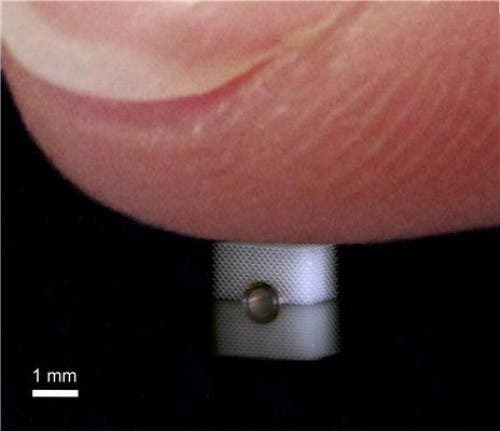 The metamaterial in case is actually in a crystalline material, built with extreme sub-micrometer accuracy; it basically consists of needle-shaped cones, whose tips meet. The size of the contact points is calculated precisely to reach the mechanical properties desired. The resulting structure is built in such a way that a finger or a measuring instrument cannot feel its way through it. “It is like in Hans-Christian Andersen’s fairy tale about the princess and the pea. The princess feels the pea in spite of the mattresses. When using our new material, however, one mattress would be sufficient for the princess to sleep well,” Bückmann explains. So far, this is pure research – no end goal in sight. However, since it paves the way for producing materials with freely selectable mechanical properties, it could have a myriad of applications. The first that pop to mind are comfier mattresses or rugs under which you can sneak a cable or two and not feel them; however, investing in such a high-end technology for this type of results is not something doable at the moment.